I came across this herd of Roosevelt elk grazing in a meadow. 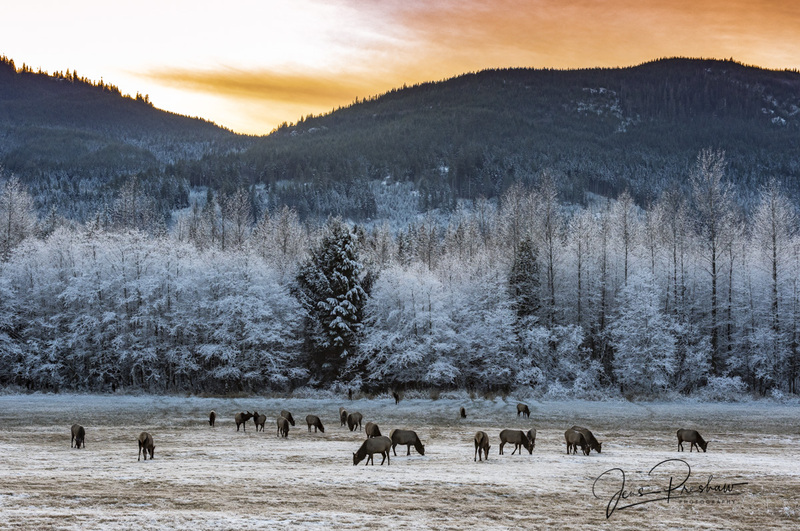 With the setting sun and frosted trees in the background it created a beautiful winter scene. Roosevelt elk have a golden brown coat during the summer and a longer, grayish brown coat during the winter. Their legs, head and neck remain dark brown year round. Have a wonderful Christmas and happy new year. Click on the photo to see a larger version. This entry was posted in British Columbia, Holidays, Mountains, Science, West Coast, Wildlife, Winter. Bookmark the permalink.